I bought a Chinese jar (see attached pictures) in the Philippines a couple of years ago. It was found in south Palawan, dug out in a beach. The guy who found it told me, that it contained bones when found. So far nobody could really classify it. I hope the pictures still show some details. 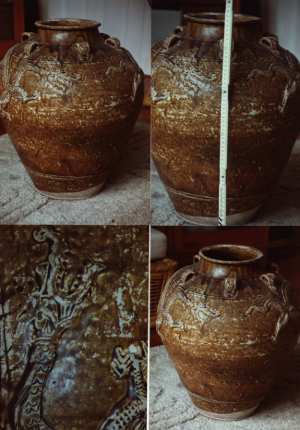 The jar is about 70cm high, green-brown colour and has dragon reliefs all around. Your jar is a South East Asian "Martaban" jar. It is a storage vessel made for shipping food and water. It was used both on the western East India trade and among the local Djonk trade. The jars are generally said to come from the city of Martaban, west of Bangkok on the coast of the Bay of Bengal, hence their name. Unfortunately these jars have been practically unchanged from the 13th/14th century up until the 19th century. For me there is therefore no way of telling the age of these jars other than by comparison with better documented Chinese porcelain, and it is only by the decoration - dragons , borders, general shape etc. one could get any idea of its age. The fact that the jar contained bones when found should possibly indicate the later part of the possibly period i.e. 17th to 18th century. Please note that my dating is very conservative. I don't think many would have argued against a Ming date on this Jar, maybe even Early Ming, but as I mentioned they are very hard to date and I personally prefer playing it safe. Naturally a "wrong" date is wrong even if its too late as well as if it is too early. The simple fact is that the subject needs to be studied further, and since I am not aware of there being any chronology published on Martabans (yet) we have to make do with comparisions.